This week taxi fares rise for the first time since 2008. The increases range from 16 percent to 20 percent. Since taxi fares have not increased for the past nine years the rises cannot be said to be unreasonable. Nevertheless, the responses to the increase are mixed. In an open society like Hong Kong, it is not surprising to observe divergent views, particularly on fare increases. The important issue here is not about the rationale behind the fare increase. It is about the service quality of the city's taxis. Hong Kong has a fixed number of taxi licenses. Very often, these taxi licenses are in the hands of taxi companies. Taxi drivers either need to buy the licenses from these firms or they have to rent the taxi cars from the license owners. Because of this unique market structure, taxi licenses command high prices. The current market price for a taxi license can easily hit HK$6 million ($772,000) to HK$7 million. As a result the cost for the license constitutes a lion's share of the taxi fare. Taxi drivers who buy licenses on credit have to repay the bank loan; these costs are reflected in the taxi fare. For drivers who rent taxis, costs are part of the fare. For taxi drivers fare increases do not mean more income. A simple logic will explain this: The increase in taxi fares will push up taxi license prices further. Since the taxi license market is an oligopoly, taxi companies virtually control the market. They will increase the rent so drivers will not be better off after the taxi fare increase. This market structure determines the service quality. Because taxi drivers do not earn more even when there is a fare increase, they have no incentive to improve service quality. It is not surprising to see the quality of taxi services keep on declining. The general perception is that the service quality of taxis is not satisfactory, prompting calls for more competition. When Uber made inroads into the local taxi market, it was natural to observe many customers turning to the mobile app for taxi services instead. To cope with the competition of car-hailing operators, better taxi service is the key. 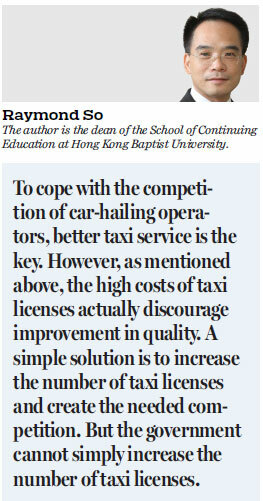 However, as mentioned above, the high costs of taxi licenses actually discourage improvement in quality. A simple solution is to increase the number of taxi licenses and create the needed competition. But the government cannot simply increase the number of taxi licenses. Many people have already made investments in taxi licenses. Any change to the rules of the game will lead to strong protests. In the past, there have been protests with taxis jamming roads. The government simply cannot resolve the problem. In the old days, the government would turn a deaf ear to this issue and pretend it did not exist. Yet, the Uber experience makes the "business as usual" approach not applicable. The idea of introducing a kind of premium taxi is a response to this problem. Indeed, this is the real solution to this decades-old issue. On one hand the introduction of premium taxi service can help solve the legal issue involving the operation of Uber and other unauthorized limousine services; on the other hand, this new tier of taxis will not disarrange the original market structure. From this point of view, it is a well-thought idea that tackles two problems with one solution. Understandably, taxi license owners oppose this idea. The logic is simple: Any new idea could mean potential impact to the market structure. Even though the number of premium taxis to be introduced under this scheme will be limited, taxi companies still worry about unintended ripple effects. But we cannot just sit on our hands and do nothing in order to protect established interests. If the proposal is a good one which can enhance the welfare of society, we should go for it. My personal view is that this proposal is a good one and it will gain the support of the public.